In mid 2017 we made a decision that radically changed the future of Prairie Film Co. To understand the what Prairie Film Co. is today, you need to see where we came from. 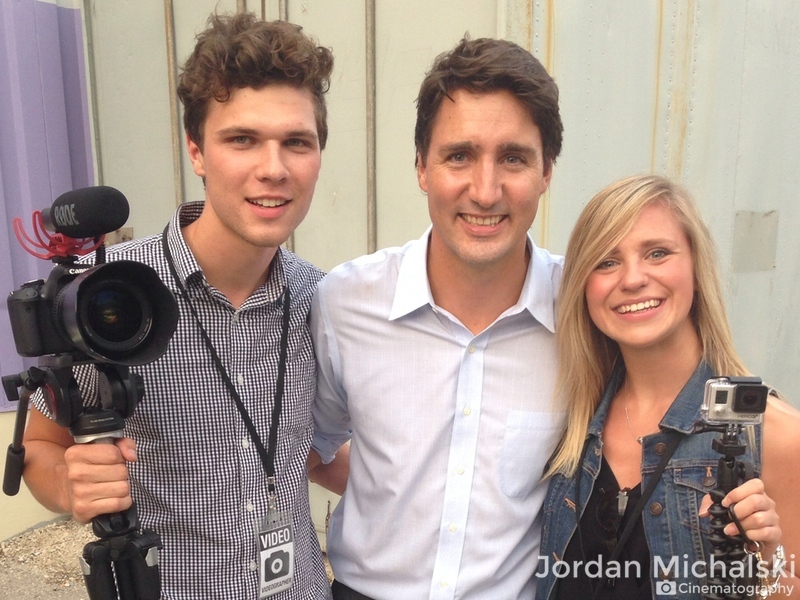 After a shoot with the Liberal Party of Canada, we had to take selfies with the future Prime Minister. We still laugh at Lauren holding up a GoPro and our baby faces. In 2014 while I (Jordan) was in university studying Education, and while Lauren was studying nutrition, we took out a loan of $5,000. This money was used to start Prairie Film Co. The money was spent on camera gear and marketing in the attempt to secure paying clients in the video business. One thing led to another and before we knew it we received a phone call from the Liberal Party of Canada, asking us to film Justin Trudeau on a stop in Winnipeg. We sent them a modest proposal, and they accepted. This led to a host of corporate jobs in the political sphere, many fantastic new business connections and an increase in brand recognition throughout Winnipeg. It was at this point that we realized that Prairie Film Co. filled a void in the Winnipeg videography market and that things really had the potential to take off. By 2015 we had a full summer of weddings booked and numerous commercial opportunities, the business was growing faster than we could imagine, our revenue from 2014 to 2015 had multiplied by a factor of 10. This year also brought about a host of new personal challenges: a job offer and prospective move to the west coast, graduation from the University of Manitoba and our engagement. Things were getting real. Filming a time-lapse on the dock during Kevin and Eli’s wedding at La Place Rendez-Vous in Fort Francis Ontario. This is a photo captured by WJB Photography at our first wedding ever back in 2014! We’re thankful for Brendan and Marissa and the risk they took hiring us! We partnered with Lauren Wiebe from Stone House Creative for a styled shoot out at Cielo’s Garden. In 2016 things were in full blown crazy mode. I (Jordan) was working full time at Soul Sanctuary, a church in South Winnipeg, and Lauren had quit her job to focus solely on finishing her degree and keeping Prairie Film Co. running. We decided to make a shift and scale our company for incremental growth, I’m a big dreamer and when I set my mind to something, I hustle to make it happen. We dreamed of being the biggest wedding video production house on the prairies, of shooting 300+ weddings a year. Sure enough, our dreams starting coming to fruition. In July of 2016 Lauren and I got married, in the same month, our company shot 16 weddings. Keep in mind that in July of 2015 we only shot 3. We had added multiple videographers to our team, and while navigating a massive personal life change we continued to grow Prairie Film Co. into a beast of it’s own. By the end of 2016 we had captured innumerable precious memories and produced scores of commercial projects. With all this build up, you may expect a crashing climax which led to some sobering realization that we were growing too fast, but nothing like that happened. It was a slow process of realizing that while we thought we wanted massive growth, we actually didn’t. We started making wedding films because we loved the art, not to become a wedding film factory. Over the next few months we started to reevaluate the direction of our company, to determine what we really wanted to achieve. We had already booked another massive year of weddings in 2017 and we were determined to produce the best possible work for our clients, but we looked ahead to 2018 with new eyes. Putting the prairie into Prairie Film Co. Putting the prairie into Prairie Film Co 2.0. In 2018 we relaunched our website and completely refocused our brand. We went from being a “big company”, to being a small production house focused on what mattered most to us. We wanted to build genuine relationships with our clients. We wanted to put careful attention into every project. We wanted to be able to also spend time at our church, Soul Sanctuary, working with high school students. We wanted to be able to enjoy the video making process. We wanted to be able to enjoy the lake during the summertime. We wanted to tell love stories in a personal, real way. So that’s exactly what we did. We made ourselves a rule: we’ll only accept two wedding commissions each month. This flies in the face of how our industry operates. Considering that the overwhelming majority of weddings in Winnipeg occur during July and August, this means that we were leaving tens of thousands of dollars on the table, waiting to be scooped up by other videographers. But we were okay with that. We realized what mattered most to us, and we chose to prioritize it. When we chose to limit our commissions we found that we had to say ‘no’ to a lot of opportunities, which made us sad as we considered the parties, celebrations and memories we were missing out on. However, when it came down to it, we realized that we were in fact able to operate in other areas of passion, while providing the clients we did book with an exceptional experience. In September 2018 we bought our first house! We gutted it and spent the next three months redoing every visible surface in the home. We were without an office for three months and this, obviously, created a three month backlog for us. However, we can easily get over a three month backlog while taking two clients a month. If we were editing 16 films a month, there is no way we could’ve survived. As we look ahead to 2019 we are grounded in our identity as a company. We are thankful for all the lessons we’ve learned and opportunities that have come our way. We continue to work with a number of commercial clients and we book a maximum of two weddings a month. Our approach is undoubtedly unorthodox, but it allows us to care for our clients, to operate in our passions and to enjoy what we do.